The dew point temperature is the temperature to which the air must be cooled at constant pressure for it to become saturated. The higher the dew point is, the more uncomfortable people feel. This is because people cool themselves by sweating and if the dew point is at a high temperature, then it becomes more difficult for sweat to evaporate off the skin. High summertime dew point temperature readings were frequent news stories during the sweltering summer months in the late 1990s to mid 2000s. 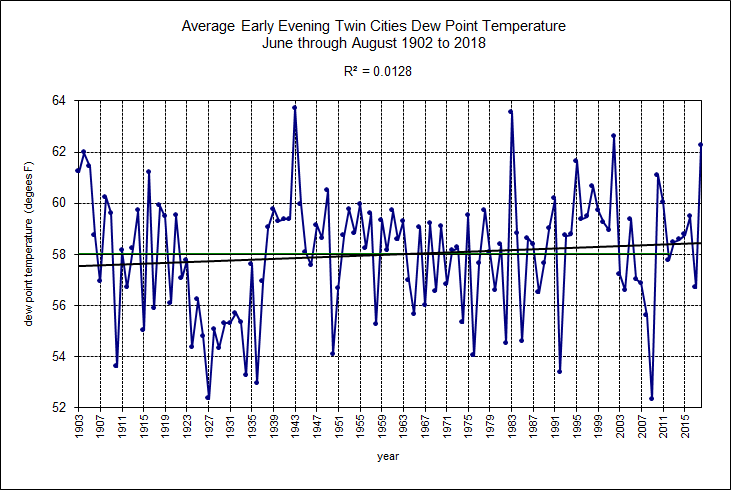 Are summertime Twin Cities dew points increasing? Here is a look at part of the Twin Cities dew point record that may answer some questions and bring up new ones. Dew point measurements began in September 1902 at the Minneapolis Weather Bureau in downtown Minneapolis. As far as can be determined the dew point was measured at the top of the old U.S. Court House building. Dew point readings were only measured once per day at 1800 hours. Later, a Noon observation was added. At 1:00 pm April 9, 1938, the official record was transferred to the Wold-Chamberlain terminal building at what would become the International Airport. The measurements were made on the roof of the terminal building until 1960 when they were moved to five feet above the ground on the airport grounds. On June 1, 1996 an ASOS (Automated Surface Observing System) was installed and took over as the official measurement at the International Airport. Historical data were analyzed for the "meteorological summer", the months of June, July and August. During the summer, the minimum dew point temperature typically occurs at sunrise. There are two maxima, one just before noon, and another near sunset. Thus the early evening dew point is typically not the maximum for the day, but has a tendency to be close. The graph below shows some interesting results. The first of which is the minima beginning in 1924 and lasting until 1937. This stretch of lower dew points matches well with the Dust Bowl era when precipitation was also at a minimum. The period 1938 to 1945 corresponds with a period of higher precipitation that immediately followed the Dust Bowl. Note the similarity with the 1990s. The high dew point period of the 1990s to the early 2000s also reflects an era of higher precipitation. The lack of dry dew point years from 1993 to 2002 stands out. Both 2003 and 2004 were somewhat drier in the Twin Cities and the dew point values reflect that accordingly. 2005 saw a return to average summer dew point temperatures that were above the long term mean. 2006 through 2009 fell below the long term mean. In fact, 2009 had the lowest 1800 hour summertime average for the 107 year record with 52.3 degrees. 2018 had the 4th highest average evening dew point temperature. Dew point temperature data used to construct this graph are available as a comma-separated value. 80 degree dew point temperatures are rare in the Twin Cities historical record. Since 1945, there have been only twenty-eight hours of 80 degree dew points recorded. Ten of those twenty hours came in a ten hour period on July 12 and 13, 1995. 8 hours are from July 17-19, 2011. The highest dew point temperature ever recorded in the Twin Cities was 82 degrees at 3pm and 4pm July 19, 2011. This broke the old record of 81 degrees at 11am on July 30, 1999.